The American Academy of Pediatric Dentistry recommends a child visit the dentist for an initial oral evaluation within 6 months of the eruption of his/her first baby tooth and no later than their first birthday. It is important to start children early in the right direction to good dental hygiene and building healthy, life-long habits. You can make the first visit to the dentist enjoyable and positive. Your child should be informed of the visit and told that the dentist and staff will explain all procedures and answer any questions. The less to-do concerning the visit, the better. It is best to refrain from using words around your child that might cause unnecessary fear, such as needle, pull, drill or hurt. Pediatric dental offices make a practice of using words that convey the same message, but are pleasant and non-frightening to a child. We encourage patients to come back to the treatment room alone so we may build a secure and comfortable relationship with them. We find when the parent is present, their attention to us is divided. If a parent must accompany their child, we ask that they be a silent observer. If we request a parent's presence, ask that only one parent be in the operatory and other family members stay in the reception room. 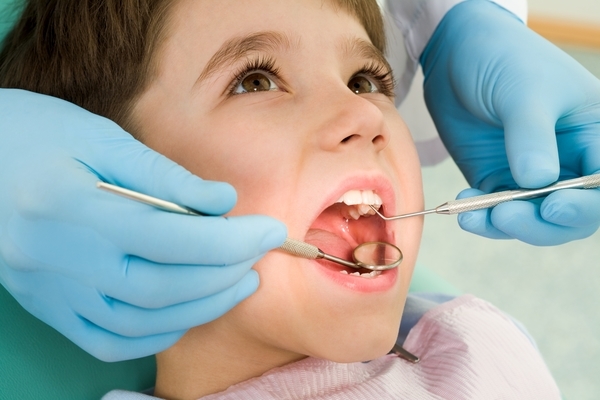 Oral health education, brushing techniques, flossing, healthy snacks and fluoride recommendations are just some of the topics discussed during your child's initial cleaning and exam appointment.